Things have been a bit quiet out there for a few weeks, mostly because it's been summer vacation time in the Northern Hemisphere, but there are rumblings of exciting things happening. Top of the list, Jack Kincaid has just released a PDF copy of Hoad's Grim, available right now for free download or to be read online. E-book fans, go grab it right now, it's an absolutely brilliant book. JC Hutchins has completed his Sword of Blood podcast, and has been writing a series of seven short stories set in the days prior to the first chapters of Seventh Son. Follow him on Twitter, and you might even get a chance to make an appearance - if you're lucky. If you're in the States, you might still be able to catch Scott Sigler as he travels about the country on his Tailgate Tour, buying his fans beer and signing books. He just dropped in on Ann Arbor, Michigan, the location of his fantastic horror/sci-fi novel Infection, to a rousing welcome. Even James Melzer made the trip all the way from the cold white North to join the party, but now he's back home and getting back into his excellent Invasion podcast with renewed energy - but then he's off again, heading to Horror Realm in Pennsylvania. Horror fans, that would be your chance to meet the Zombie-God himself, and maybe get a free signed audiobook of The Zombie Chronicles. Go on. You know you want to. Seth Harwood, too, is back in the saddle after a well-earned break, and podcasts from the Hot Tub are back on the menu. His most recent houseguest was Goblin Market author and podcaster Jennifer Hudock. Top quality stuff, I assure you. Speaking of JC Hutchins and Scott Sigler, Podioracket will be interviewing both of these podcast trailblazers in the next few weeks, as well as Lost Gods author Drew Beatty. Listen out to Blog Talk Radio or follow Podioracket on Twitter for more info. Now, in the Cool-Stuff-I've-Recently-Discovered Department, I'd like to mention a few in-progress podcasts that I've been listening to lately. I've just started into double Parsec Award Winner FETIDUS by James Durham, a post-apocalyptic drama that has turned out to be much, much more than I was expecting. When it comes to genre-bending, it doesn't get much better than zombie sci-fi fused with classic noir - and it's not just zombies running around either. I'm up to Episode Four and I can already say that this one is a must. The world and the story are hooks in the mouth right from the start, and the engineering is brilliant. Masterfully layered with ensemble voice talent and Durham's own score, FETIDUS is a pleasure to listen to. I can see why this deserved to win the Parsecs for Best Speculative Fiction Story (Novel) and Best New Speculative Fiction Podcaster/Team awards. Down From 10, by J Daniel Sawyer and performed by a star-studded cast including Philippa Ballantine and Nathan Lowell, reaches its halfway mark next week. DF10 is a curious mix of comedy, philosophy, and erotica, most definitely not one for the kids, but a worthwhile digression from the action and adventure of the rest of my usual podcast preferences. Sawyer's scripts come across as multiple conversations falling over one another, and the abilities of both the cast to record these in isolation from each other and Sawyer to edit and produce them to deliver the effect he was aiming for are testament to the cast's consummate professionalism and Sawyer's own skills, both as writer and editor. A thoroughly enjoyable and thought-provoking piece of podcast fiction. And last but by no means least for this episode, today I started listening to Guardians by Kimi Alexandre. This book is only two episodes in so far, with another issue due early next month, but so far it has me intrigued. Raegan is a bodyguard to the stars, but her world is about to be turned on its end, so we hear. And when a girl wears a knife that tight to her thigh, that can only mean trouble. The audio on Guardians is well-polished, with a collaboration of voicework which always lends a podcast credibility from the outset. I'll be listening out for more of this in the weeks to come. So should you. Until next time, keep those podcasts cranking. This article was produced as part of New Zealand Speculative Fiction Week. For more information, go to Pterodaustro Dreams. Hugh Cook might not be a name instantly recognised by readers of the fantasy genre, but to his legion of dedicated fans across the world, mention of the man and his work inspires a sense of reverence. Cook remains one of New Zealand’s unsung heroes of fantasy literature, despite his achievements outshining those of many of our more well-known authors. Between 1986 and 1992 Cook released his Chronicles of an Age of Darkness series, a ten-book cycle of stand-alone fantasy novels. Set on a world ruled by bloodthirsty emperors, threatened by swarms of monsters, and blessedly devoid of goblins and elves, the Chronicles capture a history of Cook’s lands and their people in a multitude of voices, spanning continents, and all occurring roughly within the same timeframe of a decade or two. Characters recur across the books, making cameo appearances from one story to the next, weaving a complex web of events that draws the reader through the series, however unrelated each volume may seem to be at a glance. Suffice to say that Cook rebelled, writing unorthodox fantasy in an unorthodox world. He dismantled old tropes and bent the genre like light through a smoked lens. He replaced the tired theme of good versus evil with one which instead pitted brutality against barbarism, and rarely delivered a clear victor. Cook not only rejected the clichés of the fantasy genre; he subverted them with an almost malicious glee. To judge Cook’s success by book sales alone would be misleading, but the numbers are certainly impressive at first glance. Altogether, the Chronicles sold around 450,000 copies, and that in itself is reason for celebration for any New Zealand author. 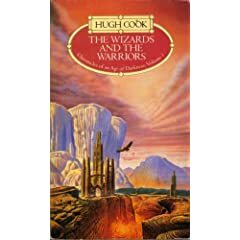 The Wizards and the Warriors, together with its US incarnation, Wizard War, sold over 160,000 copies, a phenomenal sales record for any fantasy author. Unfortunately, as the Chronicles became less conventional and more obtuse, sales began to decline. This was compounded by the decision made by bookselling chain W.H. Smith to drop Cook’s books from their shelves when sales slowed, which inevitably led to an even steeper fall. Despite a rebounding of style and content in the last three books of the series towards more action-based storytelling, Cook had largely lost the means to supply to his mainstream audience, with sales for these three books falling to between 7,000 and 10,000 copies each. I bought all my copies of Hugh’s books in my local Whitcoulls here in New Zealand, where his books enjoyed pride of place on their shelves with every release. But if the books were not on the shelves overseas, then Cook’s fans had little chance of finding them. Cook’s prose drew heavily on the landscape, places and mythology of New Zealand, from the legendary Taniwha of Quilth, to the Ngati Moana, to a prison called Maremoremo (after Paremoremo in Auckland). Our native flora and fauna often made cameo appearances in wild locales, including weka, kauri and rimu, to name but a few – all of this well over a decade before Peter Jackson delivered our country up to the world as Middle Earth. Cook refused to suffer from cultural cringe; he embraced our country’s uniqueness and used it to flavour his own inimitable world and style. 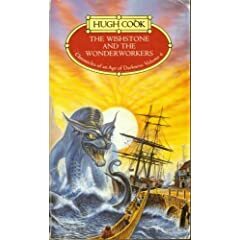 China Mieville, author of Perdido Street Station, sums Cook up nicely; “Hugh Cook was one of the most inventive, witty, unflinching, serious, humane and criminally underrated writers in imaginative fiction. Or anywhere.” It remains a shame that so few New Zealanders know that Cook was a Kiwi writer, but there is a good reason for this: Hugh Cook may have lived in New Zealand and written in New Zealand, but I suspect he saw the same tired faults with our nationalistic model of publishing and author recognition as he saw in the failure of the fantasy genre to redefine itself. Accordingly, after publishing Plague Summer here in 1980, he bypassed the New Zealand publishing model and went instead to the London market, where he secured publishing deals almost simultaneously for both his science fiction novel The Shift (Jonathan Cape, 1986) and the first volume in the Chronicles series, The Wizards and the Warriors (Corgi,1986). What separated Cook from so many of his contemporaries was his ability to alter his prose style from book to book, while he never lost his unique authorial voice. Two of the Chronicles, The Wishstone and the Wonderworkers and The Wazir and the Witch, take the form of actual recorded histories, thick with the idiosyncrasies of both the imaginary scribe and subsequent editors, and are thus peppered with redactions and long, apparently unrelated diatribes. These books are full of acerbic dark wit and bleak philosophies, and represent, in some ways, Cook’s ultimate success at writing fantasy that transcended the sword and sorcery models of the genre. For all their apparently random digressions beyond the story, these two books might be seen as the pinnacle of Cook’s genius, for there is a depth to these tales that no amount of Feistian swashbuckling or Eddingsesque adventuring could rival. Some readers even suggested that ‘Hugh Cook’ was not one writer but many, a collaboration of individuals writing in isolation with a single grand design in mind. But Hugh Cook was just one man, a prolific author and poet, whose storytelling skills ascended beyond the formulaic norm into something infinitely more enduring. Ironically it was these two books, with their challenging diversions into philosophy and metaphysics, that seemed to undermine Cook’s mainstream success. Book sales for these two volumes showed a steep slide from his earlier highs, and may have contributed to the W.H. Smith decision and its consequences for Cook’s publishing career. Cook did with fantasy what hard science fiction does to that broader genre, by delving into in-depth ruminations of the unknown and fantastical in the body of his storytelling. Cook teased apart the nature of magic and the supernatural as demi-scientific concepts, as well as exploring the brutal underside of human nature as represented by its practice in politics and warfare – stark metaphors for the real world, despite being dished up in the barbaric soup of a fantasy setting. Apparently, booksellers suspected that works of this complexity and wisdom would not be appreciated by fans of the tales of blood-soaked armies, pirates, and torturers that had preceded them. This was truly a pity. Cook’s epic plan for a sixty book series was accordingly cut short, and after publishing the brilliant conclusion to the Chronicles, The Witchlord and the Weaponmaster, he went on to champion print-on-demand technology and electronic formats, constantly moving into newer and stranger worlds with his writing. He was among the first authors to publish works through Lulu.com with the Oceans of Light trilogy and later, Cancer Patient. Even so, the Chronicles remain Cook’s legacy, and copies of these volumes continue to fetch outlandish prices in second-hand book markets around the world (my own collection must be worth a small fortune, according to Amazon – but it is most certainly not for sale). Cook was diagnosed with Non-Hodgkins Lymphoma in 2005. He endured months of chemotherapy and radiation treatment in Auckland, which briefly sent the cancer into remission. During this ordeal he wrote Cancer Patient, a collection of musings, poetry and recollections which document his struggle with the disease and what he learned about life and the human condition in the process. This book is available for free as an online e-book or as a download from zenvirus.com, one of Hugh’s many websites. Unfortunately in 2007 the cancer returned, and Cook passed away on November 8th, 2008, after bravely battling the disease for so many years. It is a testament to the scope of his fanbase that the obituary I wrote for him, which was published in the New Zealand Herald and which I posted to my blog in December last year, remains one of my most frequently visited pages. Ultimately, Cook was both Wordsmith and Warrior. Poems, stories and characters were his tools and his weapons. He wrote with a passion, producing fiction at a prolific rate, and the English language would be greatly enriched if all the words and terms he had coined in his oeuvre were to be introduced into common parlance. He fought to find new ways forward in the publishing world, exploiting technologies that are only now starting to establish their true place in the electronic market. He maintained his integrity as an author to the very end, determined to always share the stories he had to tell, and not those that others wanted him to tell. At the end, he fought an unseen enemy – fought it and beat it, if only for a short time. Even in this, he had a story to tell, one that may not have been able to completely defeat that insidious foe, but which may yet bring comfort to others who face those same demons at some stage. 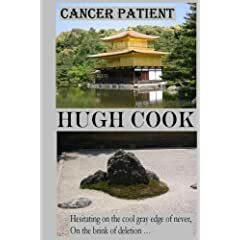 For those of you interested in reading Hugh Cook’s work, samples and full-length copies of some of his books can be found at zenvirus.com. Also, keep an eye out for a reissue of The Walrus and the Warwolf, due for release in 2010 by Piazo Publishing, with an introduction penned by China Mieville. The surf is creation and rebirth. I would like to thank Colin Smythe, China Mieville, and the Cook family for their kind assistance in preparing this article. 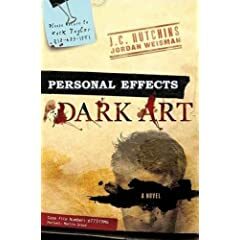 Readers of this site will no doubt already be aware of who JC Hutchins is, his epic technothriller 7th Son series (link is to my review), and probably of the innovative work that is Personal Effects: Dark Art. If you are not, then you should be. Otherwise you risk missing out on bearing witness to the rise of one of the most important writing talents of this century. Hutchins is more than just a fine writer of science fiction thrillers and supernatural horror. JC Hutchins is a pioneer in both the world of social media and in interactive fiction as a whole. Besides his claim to fame as one of a select group of writers who adopted podcast technology to share their stories for free and to develop audiences that publishing marketers would have completely missed, Hutchins has proved himself to be an innovator in both audience engagement and fiction delivery. From his Obsidian series of fanfic short stories, which drew submissions from such luminaries as Matt Wallace, Mur Lafferty, Tee Morris, and Christiana Ellis, to running flash quizzes on Twitter with the prize being a cameo appearance in his new collection of short stories, Hutchins continues to push the boundaries of fiction, and to enthrall his fanbase in the process. Personal Effects: Dark Art is no exception. Taken as a book on its own, PE:DA is a breath of fresh air in a market of tired blockbuster hacks weighed down the morass of meeting publishing deadlines. Hutchins' writing in this book is dark and edgy, almost conversational, reminiscent of Kesey, yet bristling with ominous undercurrents. Perhaps it was simply that I read the book in Hutch's voice, familiar as I am with his tone and delivery, but there was an injection of life in this book that is sadly lacking in so many of today's big-name authors. The other thing about PE:DA is, of course, the personal effects themselves. The book comes with a pocket full of documents and, well, personal effects: credit cards, appointments slips, drivers license, as well as photos and drawings. It is possible to read this book on its own, but there is another layer to be explored in the story, by chasing up the clues that appear in text and in the personal effects. There are phone numbers to call and websites to visit, as well as clues that allow the reader to delve deeper into the mystery of Martin Grace than even Zach Taylor, the protagonist, gets. Is it a gimmick? Perhaps. But if so, it's one of the hands-down coolest gimmicks to accompany a book that I've ever seen. The images and the information that the effects conjure forth are chilling, perhaps more so than the story. But the story itself is a powerful journey regardless. The three elements - the book, the personal effects props, and the world of clues that lie beyond the book - serve to enhance each other, creating an experience which is somewhat more substantial than the sum of the individual pieces. Is it the future of storytelling? Well, that all depends on how well PE:DA does in the marketplace. It's the sort of thing I'd certainly like to see more of. At the end of the day, however, only book sales will determine whether or not this bold venture into multi-dimensional story-telling will sink or swim. For sheer creative flair, PE:DA is a clear winner, and it's a damned enjoyable read all on its own. I'm going to give it 4.5 Stars, and recommend you get your hands on a copy. If you haven't checked out Hutchins work already, then a good place to start is probably with the podcast exclusive prequel novella to PE:DA, called Personal Effects: Sword of Blood. It's not yet complete at the time of this post, but it's well worth a listen to get a feel for how Hutchins writes. And then when you read PE:DA, you might hear it in Hutchins' voice in your head, too.